I know, I know. Kimchi isn't cooked. It's pickled. But what if you want the flavors of kimchi and don't have time for the fermentation process? That's how I came up with this dish. 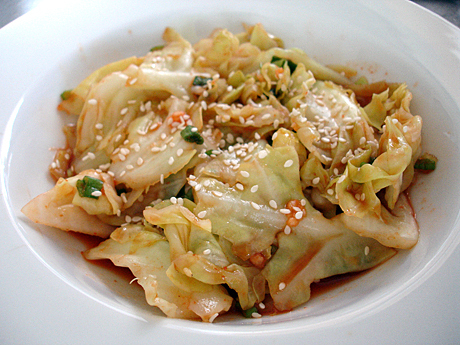 I thought about kimchi: cabbage that ferments in a brine including chilies, garlic, ginger, green onion and other ingredients. I minced some garlic, ginger and onions, then mixed it with sriracha hot sauce. I added soy sauce because it is salty and made from fermented soy beans. To add to the fermented flavor, I used a little bit of fish sauce. (Some regions use salted anchovies or shrimp.) I also added some rice vinegar for more acid and because it too is fermented. I briefly cooked some cabbage (regular green since I didn't have napa) in a hot pan with just a little water to soften the leaves, but maintain crispness. 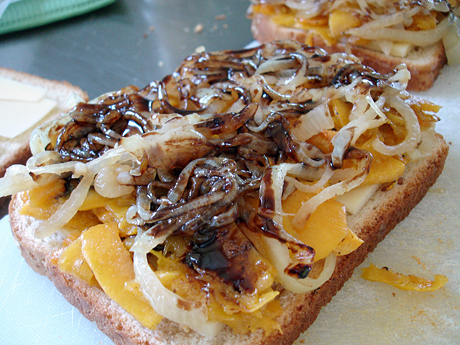 Then I added it to my sauce, which I wanted to leave uncooked to keep the sharpness of the onions and garlic. I sprinkled on some sesame seeds and let the whole thing cool. 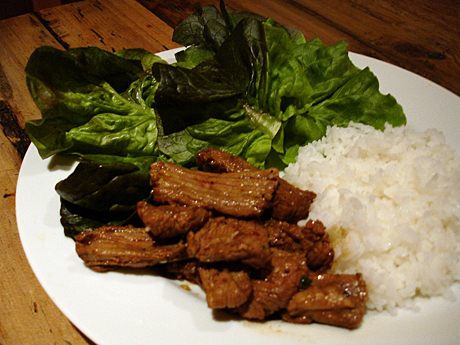 It's not quite kimchi, but it worked well with the kogi-style beef and lettuce cups we had for dinner. The next day I made some more kimchi-flavored cabbage and ate it hot over rice. My mom searched and searched through old food magazines while I searched and searched the internet for a corn and potato salad with crème fraiche dressing. We had made the recipe before so I couldn't understand why it didn't exist anywhere online. Finally my mom found it in our June 1995 copy of Gourmet. Except crème fraiche wasn't an ingredient. 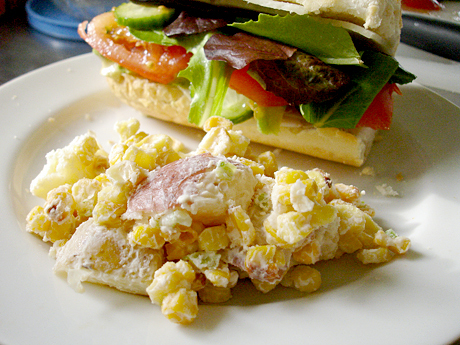 We've both made this corn and potato salad with crème fraiche (or sour cream) several times, when all the while it was meant to have buttermilk instead. Well, our version is great and deserves to be known, too. Or you could make a few substitutions and call it your own. You'll want to take the credit. This is the potato salad that changes the minds of potato-salad-haters. The corn is sweet, the dressing is tangy…it's so good, we served it New Year's Eve on a bed of baby romaine next to lobster and filet mignon. This salad, while hearty and delicious, was especially satisfying to me because of how much thought I put behind it. It might sound silly to some, but I spent two days thinking about just how exactly to use the first fresh beet I ever bought. I knew I wanted a roasted beet salad. I had some asparagus and fennel in the fridge — either of which would have paired well with beets. I went back and forth between the two, considering a dozen vinaigrettes in the process. Balsamic? Citrus? Red or white wine vinegar? What fresh herbs would I use? What about cheese? Shaved parmesan? Crumbled bleu or goat cheese? 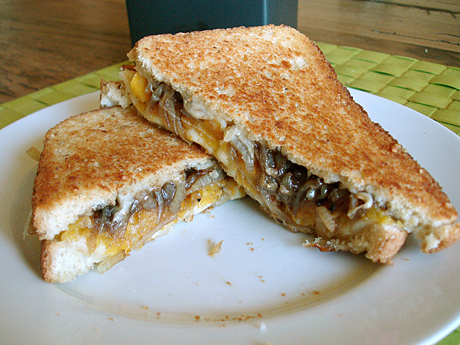 I couldn't decide, so I put off the salad and picked up a grilled sausage sandwich for dinner instead. The next morning I woke up to rain. Ok, roasted beets and asparagus it is, I thought. As I pondered the cheese question again, it hit me — what about a poached egg instead? People do that with salads or asparagus all the time. Would it work with beets? Why not? Aussies put beets and fried egg on their burgers. 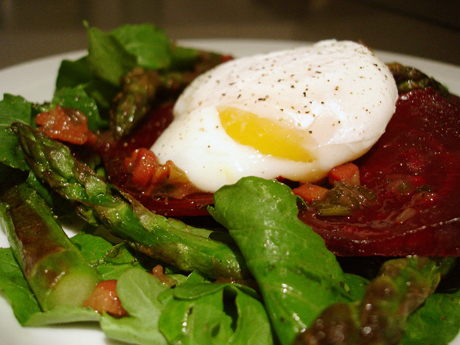 I searched recipes online to see if anyone else had done a beet and asparagus salad with poached egg. 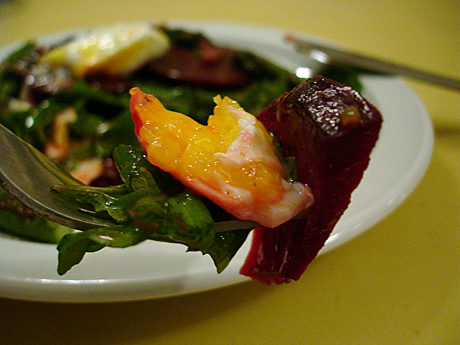 I didn't see anything exactly like it, but this salad with golden beets and an egg convinced me I was on the right track and inspired my vinaigrette choice. Cook and Eat's red wine-prosciutto vinaigrette made me think of Craig Cyr's warm bacon dressing I'd made and loved before. It all came together in my head at that point: I'd start with arugula, a peppery green that is as far as I can go on the bitter scale (frisee, endive and others aren't for me). Then sweet roasted beets and tender asparagus would be drizzled with a warm vinaigrette made with red wine vinegar, pancetta, green onions, chives, honey and olive oil. To top it all off, a poached egg and black pepper. The result was everything I hoped it would be. Oh, and fresh roasted beets? Where have you been all my life? Same with poached eggs. I was silly ever to have had aversions to either in the past.